NorthStar and regional leaders have announced plans to provide two new shuttles. Both shuttles are set to start mid January during peak ski traffic season. NorthStar to Heavenly: January 16, - April 5th, 2012. Monday through Thursday, $15 per person round trip. Stops include the North end casinos and the Incline Village Hyatt. The Truckee- Tahoe Free Ski Shuttle will go from Truckee to NorthStar or Squaw Valley. Park n' ride lots will be located at Truckee High School and the Truckee airport. Buses will run from 7:00am to 7:00pm every 1/2 hour. This bus service is a "pilot" program which will be used on Martin Luther King, Jr. weekend, January 14-16. 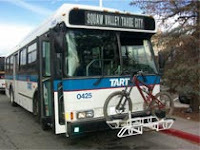 The Tahoe Area Regional Transit (TART) is the agency that provides public bus service in the North Lake and Truckee. This service is great. They haul my bike around in the summer and my skis in the winter.